Let us start our Tuesday morning with hearty laughter, shall we? Princess Sparkle Pony, a sometimes Wonkette writer, has served up the goods, envisioning what it might look like if Fundamentalist Christians spent more time hating things that are more clearly condemned in the Bible, but that are considered very out of date by modern religious people, instead of constantly focusing on gays and reproductive rights. What would the currently anti-gay media look like then? 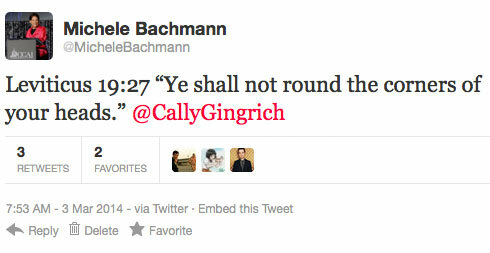 And what would Michele Bachmann tweet? 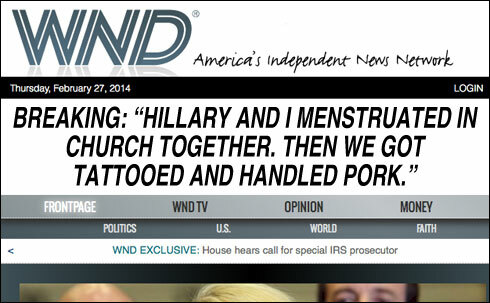 And what might the front pages of World Net Daily look like? Well done as always, Princess Sparkle Pony. Click over for the rest. NOM and Westboro Baptist get the treatment as well.